I just updated to Safari 5.1 and some of the important Safari extensions I use don’t work. Is there a way to revert to the last version of Safari? If you have a backup that extends back to the time that you had Safari 5.0.x I’d try restoring it from that backup. If not, follow along. First, toss Safari 5.1 in the Trash. You may need to enter your Administrator’s username and password to do this. Launch Pacifist, click its Open Package button, navigate to the Safari5.0.3SnowLeopard.pkg file you downloaded, and click Open. In the window that appears, select the Contents of Safari5.0.3SnowLeopard.pkg entry and click the Install button at the top of the window. In the sheet that appears make sure that Use Administrator Privileges is enabled and click the Install button. You’ll be asked to enter your Administrator’s username and password. During the installation you’ll be told that some elements of the installation already exist. Choose the Update option. 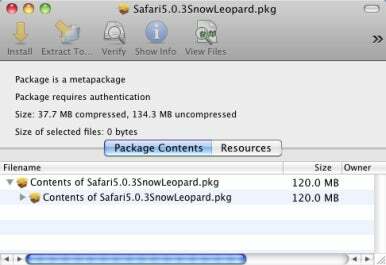 When the process completes you should have a working version of Safari 5.0.3, which runs under both Snow Leopard and Lion. All the extensions that once worked with Safari should work again.